This earnings season is going to be lousy. US companies have given analysts to understand that they need to slash their estimates, and since the beginning of the year, analysts have fallen all over each other doing just that. Now, based on the latest bout of slashing, revenues in the first quarter are expected to drop 3% and earnings 4.8%. Companies with over 50% of their sales within the US are expected to produce flat-ish revenues and earnings, according to FactSet. But companies that get over 50% of their sales outside the US are expected to see revenues plunge 10% and earnings 11.6%. Without the beaten-down energy sector, the equation looks a lot better. So this is cited incessantly. But without the healthcare sector, which is raking it in, the equation looks a lot, lot worse, which is never cited. Companies on average are going to beat these numbers, obviously. They just about always do. That’s the purpose of slashing expectations. It allows everyone to put a positive spin on a crummy report, and the media can decorate it with a “better-than-expected” stamp of approval. About 5% of the companies in the S&P 500 confessed their Q1 numbers so far. 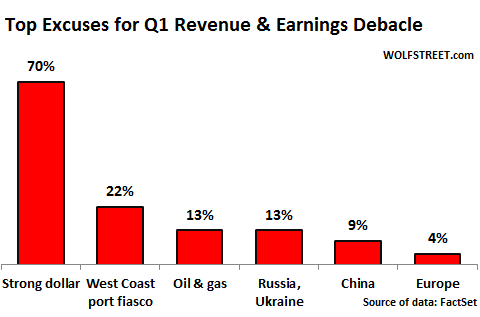 So what are the most common reasons they’re citing for this revenue and earnings debacle in Q1 and future quarters? To figure this out, FactSet searched conference-call transcripts. Turns out, the suddenly almighty dollar has been blamed by 70% of the companies that have reported so far. But this strong-dollar bashing has an ironic corollary that is assiduously silenced to death. I’ll get to that in a minute. The second most often cited reason was the West Coast port fiasco, at 22%. About $1 trillion in containerized goods per year go through these ports. The labor dispute that came to full bloom in Q1 disrupted importers and exporters. Companies had to use more expensive transportation options and longer routes, absorb demurrage charges and other costs, and deal with long delays. And some had to watch helplessly when their perishable goods perished as containers were stuck somewhere. It was truly a fiasco. But there’s an ironic corollary of this strong-dollar bashing. The dollar gained against the euro, the yen, and a number of other currencies. Revenues in those economies, once translated into dollars, appear lower; and earnings in those countries appear lower too. But the US has a trade deficit with these economies. It imports more than it exports – from auto components to smartphones. Thanks to the evil creature, the strong dollar, these imports are getting cheaper. Then there’s the plunge in the price of oil, which lowers input costs and transportation costs, among others. The strong dollar and the low price of oil combined turn into a wave of lower costs. But no one cited these factors as benefits of the strong dollar. It has been silenced to death. Turns out, lower costs are due to excellent “execution,” superior management, and fancy-sounding cost-reduction plans that CEOs and CFOs announce with great fanfare to goose the shares of their companies. Management takes full credit and executives pat themselves on the back for these cost reductions caused by the strong dollar and the oil price plunge. But these folks publicly and relentlessly shame the strong dollar for things that curdle. And then there’s a big twist: The country to which the US exports the most, after fellow NAFTA members Canada and Mexico, is China. Exports to China were nearly twice as large as those to the next country in line, Japan, and dwarfed those to European countries. But the yuan didn’t collapse against the dollar. It has fluctuated a tiny bit and is now just about exactly where it was 12 months ago. The strong-dollar meme doesn’t even apply to trade with China. But that too has been silenced to death. There are bountiful reasons in the US and globally why Q1 was lousy. Certainly, the dollar aggravated some aspects, but it also lowered costs in the import-dependent US economy and its businesses. It has no impact on the trade with, or business in China. Yet, you’d think when listening to these folks as they’re trying to pump up the shares of their companies that corporate performance is sinking into the mire because of the strong dollar. I have been reading for a month or more that liquidity has been drying up and now today I read in a link from zerohedge http://www.zerohedge.com/news/2015-04-13/unseen-recession-shocker-crushing-economy-revealed-credit-rejections-soar-most-ever about how credit is now drying up? Lower earnings, which Wolf writes about, would make sense if you were borrowing to live and not actually earning your living. If you were keeping the EPS up by borrowing? There has to come a point when those lending you money just say… Not this time! Or your income has declined enough that it is to much of a risk.. Or has the dried up liquidity caused this problem? It is hard to lend out what you don’t have access to… as everything is leveraged upon leverage I just wonder if anyone has a clue as to who’s on first? I hope this isn’t off topic, but last night I visited a number of retail sites on-line to purchase some common items that I usually buy this time of year. Nothing exotic at all. None of the the merchants had all of the items I intended to buy. I won’t name them, because I have traded with them for years and hope to continue to do so. I know this is anecdotal at best. I am wondering if this is a one off, or indicative of something more systemic. I guess what I am really asking “is this a thing”? I’ve been checking some sites for sales for months and have not seen much new merchandise added to the mix. The old inventory is still around with not much moving at all. My local closeout store, a big chain, is selling a lot of higher priced items lately, such as furniture. Everything I have purchased in the last six months I absolutely needed. Lousy figures will mean no need for an interest rate hike. Cue yet another market surge to ATH.